The Best Irresistible skid and slip resistant hospital socks for adults with treads or grips (gripper socks)! Extra Comfy UNISEX Hospital Mens slipper socks & Womens slipper socks in feather-soft polyester chenille. These rubber gripper socks for adults are offered in Regular Size & XL Size. Skid resistant and slip resistant treads for safer wheelchair transfer. No inside back seam to cause heel skin issues. Nonskid socks are perfect for acute care, outpatient and long term care patients. These anti slip non slippery socks for adults are terrific for patients in hospitals, post surgery, nursing homes and retirement homes. Non-skid socks are great for comfortable casual use in the home and for home care settings. Concerned about slipping socks on tile or hardwood floors skid socks with grips make the best choice in selecting a sock for at home use. 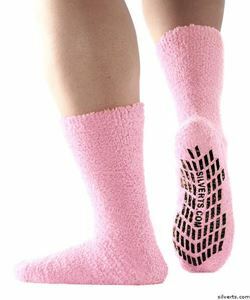 These womens and mens slipper socks with grips are used in hospital and nursing home fall prevention programs. Hospitals utilize these socks because of the non slip grips on the bottom of these slipper socks. Nursing homes promote the use of socks with non slip soles to help prevent elderly resident falls, slips and accidents. Caregivers looking after their parents at home use these as house socks with grips to make life easier for both the parent they are caring for and the caregiver. These non slip resistant slipper socks for women and non slip resistant slipper socks for men are used as lounge socks, tread socks and sleep socks because they are so comfortable. These fuzzy non slippery womens and mens gripper bed slippers sox by Silvert are a welcome gift for hospital and home care settings! These plus size womens socks are great for comfortable casual use in the home and for home care settings. These bariatric socks offer XL comfort and are used as edema socks, disabled socks, foot problem socks, and diabetic socks. Big Foot gripper socks make a terrific Christmas gift and birthday gift.